The Hatha Yoga Dandhals are an aspect of the ancient body conditioning system. 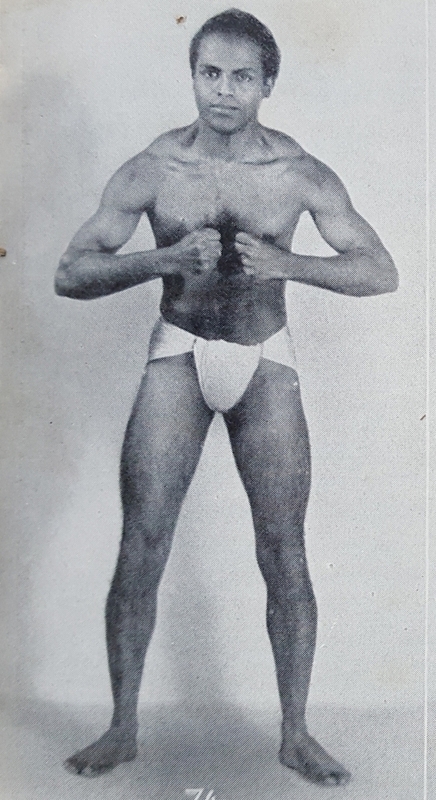 These are designed for body strength, and in modern terms would be called body building techniques. Dandhals were a very important part of yogic training for the warrior caste of ancient India ( kshetriyas), like the Vira Bhadra group of asanas that are still part of the standing poses. The power and strength developed through these exercises complements standard stretching and flexibility asanas. The only reference book on these exercises seems to be "Yoga and Health" by Yesudian and Haich, written in the 1940's and published in the early 50's. 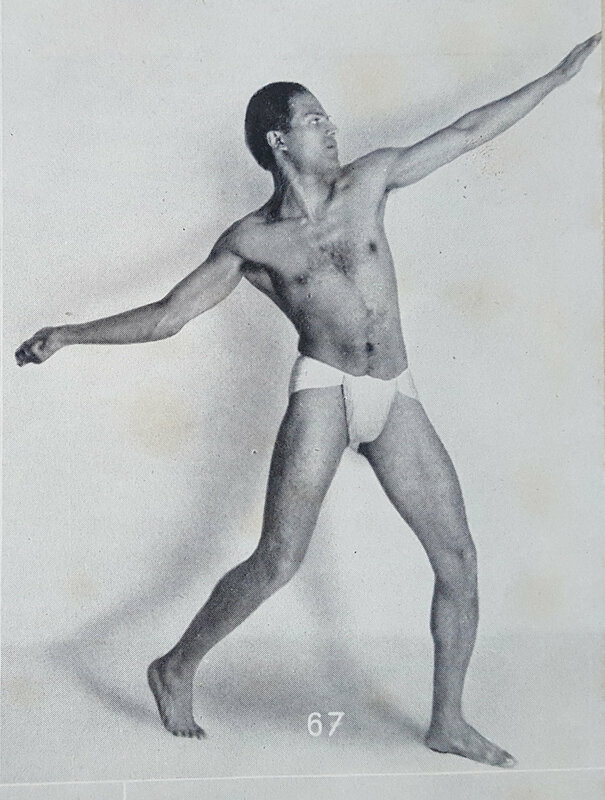 Here are some photos from the original book showing Selvarajan Yesudian demonstrate a few of the Dandhals. 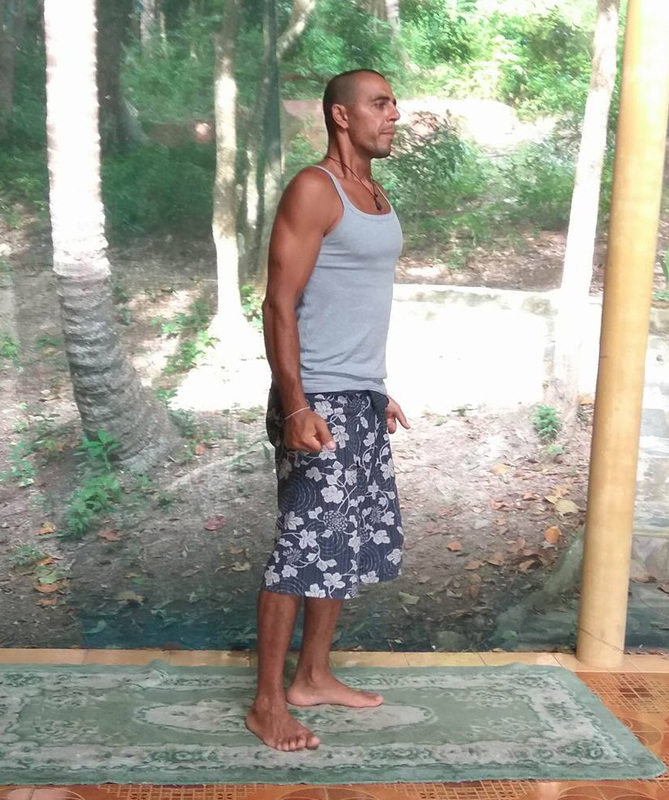 The Dandhal series are done in slow motion, with concentration on the specific muscles being contracted, and, with pranayama techniques which turbo-charge the muscle cells for empowerment and growth. First we imagine that we are lifting a heavy barbell, for instance in a biceps curl. Second we imagine the muscle contracting and growing bigger as it does the work. The third step is visualizing a flow of oxygen and prana going to the area at the same time. With this imagination, Mind is fully engaged, because the observation aspect of mind is busy perceiving the feeling of the contracting muscle, with full attention. Active part of mind is directing the movement and passive part is observing the sensation of what is happening. Added to this we have pranayama techniques using occasional kumbhaka (retentions) in conjunction with rhythmic inhalations and exhalations coordinated with the flow of muscular movements. Dandhal pranayama specifically is designed to increase the oxygen absorption to the bloodstream while directing it to the muscle tissue. In this simple biceps curl exercise, the breath is taken in deeply while standing in the first position on the left, then the arms are lifted up with intense concentration on feeling the contraction of the muscle cells in each biceps, bringing the arms all the way up to the final position on the right. In the second picture the student is holding a set of dumbbells, in the other pictures only imagination is used. It can be a good idea in the beginning of each set, to actually use some weights so as to be able to feels the work which the muscles are doing, then proceed without the physical weight. Dandhal pranayama is used when lifting the arms, pressuring the air out between closed lips, in this way adding a bit more air pressure inside the lungs and pushing more oxygen into the bloodstream. Both the breath and the movement are done in slow motion, taking as much as 20 seconds just to lift the arms up. With imagination it is possible to use 100% of the muscle cells - and you feel this as the muscle becoming fatigued within six rounds of lifting.